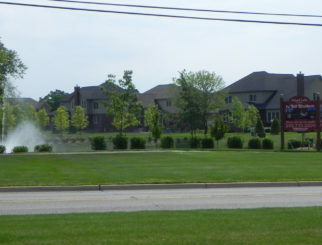 This prestigious residential development consisted of 14 phases of a 300-acre “Vistas of Novi” planned unit development on Novi Road and Thirteen Mile Road. In 1997/1998 Hughlan Development Company sold the majority of the site to several different development companies including Singh Development, S.R. Jacobson, and Fram Development. Spalding DeDecker (SD) continued to work for each of these companies. SD was the Civil Engineering and Surveying consultant on the project. SD teamed with planners and wetland planning consultants to incorporate large natural areas into the design and saved more than 70 acres of the land as preservation areas. The signature of the development is a waterfall feature at the southerly entrance from Meadowbrook Road. This waterfall is part of the storm water management system, carrying overflow to a series of detention basins and to its ultimate outlet across Meadowbrook Road. 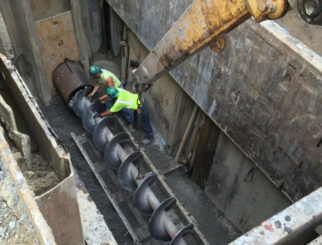 Design work covered 20,000 feet of roads, sewers, and water mains, and included 498 single-family units, 180 attached condominium units, and 257 attached townhouses. 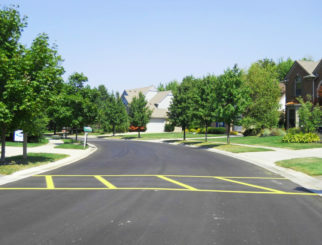 Survey work included platting and Exhibit B documents, tree surveys, and construction layout for infrastructure and buildings throughout the development.